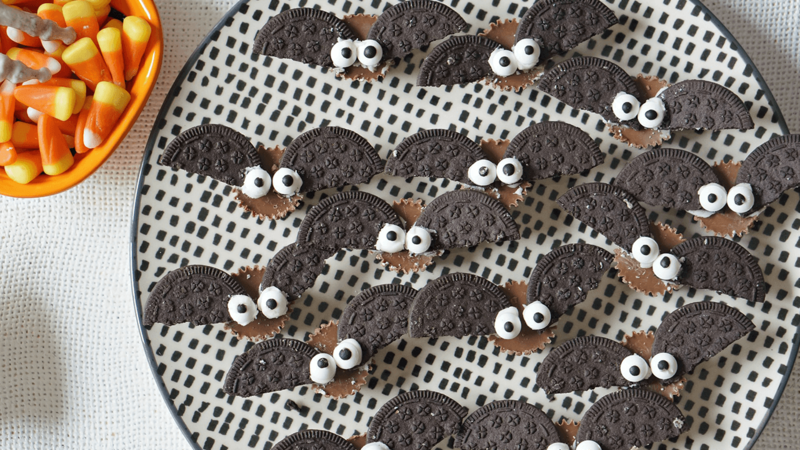 Whether you’re off to a neighborhood get-together, need to bring a themed snack to school, or just want to bring a little “spooky” to the table, we’ve got the Halloween treat for you. 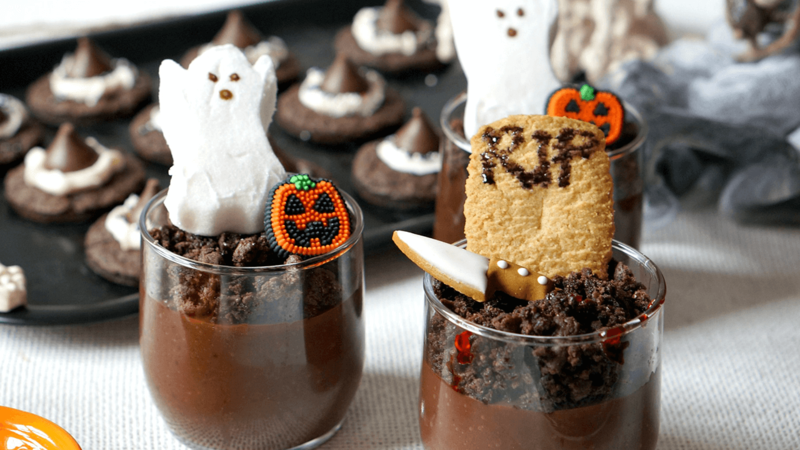 From super-cute Graveyard Chocolate Pudding Cups to the “betcha’ can’t have just one handful” Halloween Candy Muddy Buddies, you’ll find an excuse to make and enjoy all of these treats. Whisk together pudding mix and milk until smooth. Pour pudding into the clear cups. Chill until set. Meanwhile, if using tombstone cookies, write “RIP” using black gel icing on top of cookies. Preheat the oven to 325 ℉. In a large bowl, mix together cake mix, oil and eggs until a dough forms. Shape dough into ¾ inch balls and place on cookie sheets prepared with parchment paper, 2 inches apart. Bake 8-10 minutes, or until set. Allow to cool completely. Place frosting in small resealable food bags. Cut off the tip of the bag to make a small opening. Pipe a small circle into the center of each cookie. 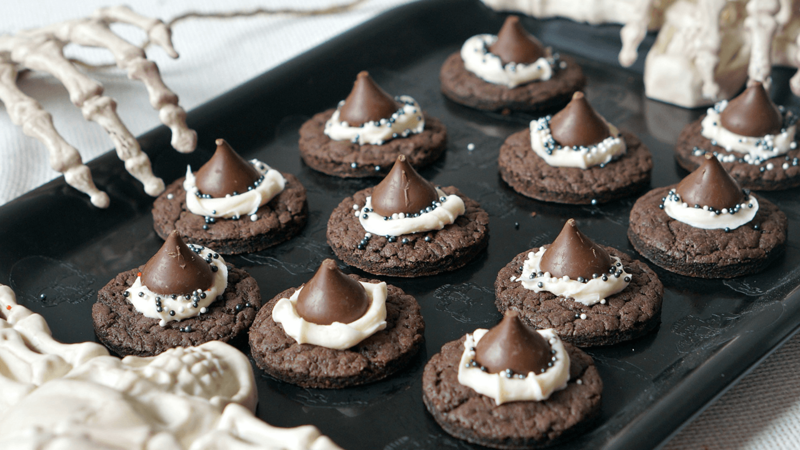 Decorate with sprinkles, then press a Hershey’s Kiss into the center. Carefully split each cookie and scrape off icing into a bowl. Cut each cookie into half-circles. Pour 1-2 teaspoons of super-hot water into the cookie cream. Stir until smooth. If you need additional icing for “glue” add additional powdered sugar and water. Using a toothpick, add a small dollop of icing to the corner of each cookie and secure it to the Reese’s cup. Repeat the process to give the bats two eyes. If the icing seeps out from the candy or the cookies, you can use a clean toothpick to scrape it off once hardened. Allow the icing to set before removing to a serving tray. In a microwaveable bowl, combine the chocolate chips, peanut butter and butter. Microwave for 60 seconds, or until just melted enough to stir smoothly. Pour the mixture over the cereal and stir gently to coat the cereal without breaking. Divide the cereal mixture evenly between the two storage bags. Add the powdered sugar to one bag and the brownie mix to the other. Seal the bags and shake to coat. Lay the bags out flat and allow the mixture to set, at least 30 minutes. 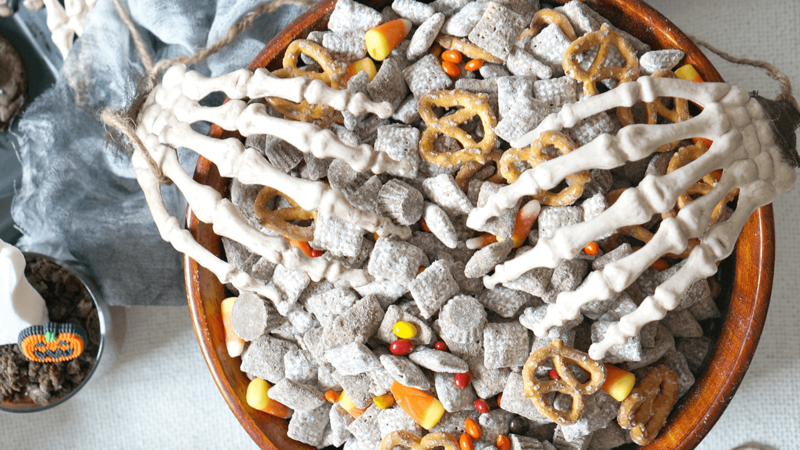 In a large bowl, toss together the cereal with pretzels, candy corn and peanut butter cups. Store in an air-tight container.